As the sun slowly rises across the horizon, heat emanates from the red earth as Catherine O’Reilly makes her way down a path on the outskirts of Kigoma, Tanzania. Schoolchildren run past, dressed in uniforms faded from too many washes and the dust that constantly sweeps through the air. Cresting a hill, O’Reilly sees the sparkling morning light catch the expansive water of Lake Tanganyika—a source of life and livelihood for tens of millions of people. Like many lakes around the globe, the life that teems in and around Lake Tanganyika is at risk. The impact of rising temperatures on the freshwater lake can be viewed in the increasingly sparse catches of local fishermen. They are not alone. Climate change is robbing millions of people around the lake of food and livelihood as the fish population disappears. O’Reilly has been studying the phenomenon for three decades. In 2007 she was part of a team of scientists honored with a Nobel Peace Prize for sounding the alarm about the irreversible danger to freshwater ecosystems caused by increasing temperatures. TAFIRI Director Ismael Aaron Kimirei has known O’Reilly since 2004, when they met while she was an instructor and he was a student at Lake Tanganyika. He credits O’Reilly with working in a spirit of mutual respect since she arrived in East Africa. “We both have the urge to build the research capacity of not only TAFIRI staff, but other underprivileged researchers,” he said. 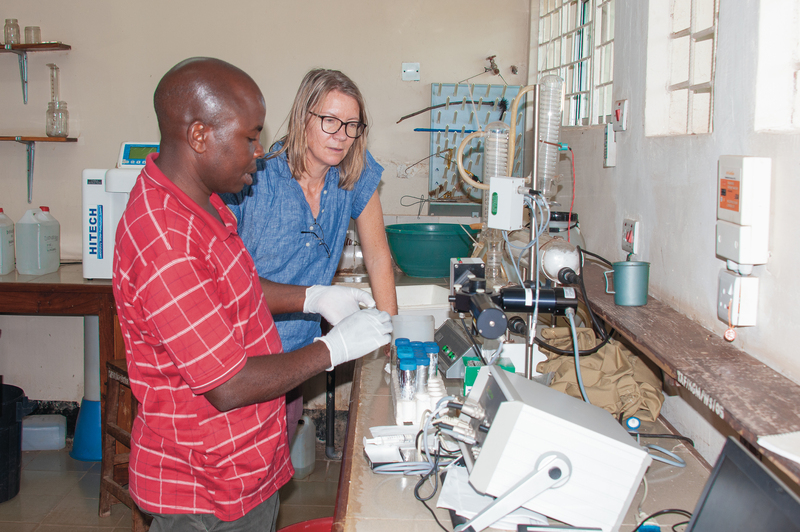 “My lab is in better shape partly because of our collaboration, but most importantly from her initiative.” The two continue to collaborate on the Projections of Climate Change Effects on Lake Tanganyika project with Peter Staehr from the University of Aarhus in Denmark, as well as on several other international research projects. Her work has been highlighted in The New York Times, BBC, The Guardian, The Christian Science Monitor, The Washington Post, and National Geographic. A 2003 paper on Lake Tanganyika that was published in Nature helped earn O’Reilly a Nobel Peace Prize. She shared the award as one of the scientists on the Intergovernmental Panel on Climate Change. “I like to say I have 1/2000th of one half of a Nobel Peace Prize,” joked O’ Reilly. She is one of four international leaders of the Global Lake Temperature Collaboration, which gathered one of the most extensive collections of data on freshwater lakes ever seen. The study, published in 2015 in Geophysical Research Letters, pulled in analyses of 235 freshwater lakes—more than half of the world’s freshwater supply. For the groundbreaking study, funded by NASA and the NSF, O’Reilly drew together 64 world-renowned scientists who shared up to 30 years’ worth of data on lake temperatures. “When people ask about the scope of the project, my mind slips back to the more than 4,000 emails we all exchanged,” said O’Reilly. “Four thousand, eight hundred, and seventy-six, to be exact.” Electronic conversations flew over the course of the five-year study, involving scholars from Denmark to New Zealand. Sharma and O’Reilly are expanding their work examining freshwater to include which lakes might no longer freeze due to rising temperatures. “Warming lakes, in particular, have large ramifications for water quality, which is essential for human survival,” said Sharma. In other words: As goes the freshwater, so goes the human race. The shared data from the Global Lake Temperature Collaboration originated from satellite measurements and scientists on the ground. “Satellites can gather temperatures from large lakes in remote places of the world, and have been for the last 25 years. But they can’t find the small lakes,” said O’Reilly. “That’s when you need the people out doing the sampling.” O’Reilly turned to the scientists in the field, individuals who have collected data across the decades on smaller lakes. The results led to a discovery: The mean temperature of lakes worldwide is escalating quickly. Between 1985 and 2009, the study found lakes are warming an average of 0.61 degrees Fahrenheit (0.34 degrees Celsius) each decade. A less-than-one-degree change in temperature doesn’t sound like much. For the planet, however, a one-degree change in the average temperature is extraordinary. When it comes to warming of lake temperatures, what once took centuries is now taking a little over 10 years to achieve, or the geophysical equivalent of a blink of an eye. “We’re talking about an average number, which means some places are warming up much more than that. Those places are going to be seeing a lot of changes,” said O’Reilly. For Lake Tanganyika, rising temperatures mean a simple shift: Fish are disappearing. The impact of that change is not so simple. TAFIRI estimates that more than 60 million people in the four countries bordering Lake Tanganyika rely on fish as their main source of protein and the lake itself for freshwater. The surrounding population has been increasing, around 4.5 percent over the last 15 years—twice Tanzania’s growth rate. “People are looking to the shorelines for fish—both for a job and for sustenance—exactly at a time when climate change is robbing fish from the lake,” said O’Reilly. Fish get a double whammy as warming temperatures also spur the growth of a special algae that produces toxins. “It’s a group of algae called cyanobacteria or blue-green algae,” said O’Reilly. “They have little gas vesicles in them, so that keeps them up near the surface of the water, which is right where they want to be because that’s where the sunlight is. So they’re very good at floating and multiplying.” Some of those algae produce cyanotoxins, which can be harmful to people and other mammals. The study predicts a 5 percent growth of these toxic blooms if temperature growth remains the same. Thousands of miles from the African lakeshore, O’Reilly is employing the same drive to bring disparate voices together to help improve water quality in Central Illinois. For several years O’Reilly, Associate Professor of Biology William Perry, and Professor of Geology Eric Peterson have worked with the City of Bloomington to install water-monitoring stations at Six-Mile Creek and Money Creek, tributaries that flow directly into the reservoirs that supply the city’s water. The systems were the latest effort in an ongoing collaboration between the city and the University to monitor and improve water quality in the area. “We’re working together to understand how to change land management in a sustainable fashion within agriculture-intensive areas,” said Perry. Related Article: Big data Professor Catherine O'Reilly receives $1.7 million grant to fund project that will help students and faculty work with large data sets. O’Reilly is also among a group of faculty establishing a Center for Sustainable Water Future at Illinois State. The center will encourage long-term water solutions through academic research, and teaching and learning opportunities from across campus disciplines. For O’Reilly, no matter where the water lies, the impact is the same. Freshwater is essential for human life, and she sees the challenges that climate change presents to freshwater lakes as a worldwide danger. “There’s a whole series of lakes out there, and they’re all going to be changing. We need to prepare for that,” said O’Reilly. The work that Dr.O'Reilly and her associates are performing is critical to our existence. The fact that politicians fail to see this as a danger to mankind is sad. Soon we will be approaching a tipping point and must alert mankind to the need for change or we will no continue to exist as a species. Great work professor O'Reilly and Team.